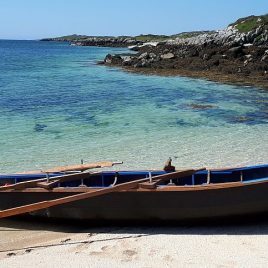 Explore the loughs and islands of Connemara’s coastline, discovering secluded bays and pirate castles. Experience the challenge of rowing these unique and iconic boats of Ireland’s Atlantic shores. Each currach needs one or two rowers, and each boat can decide how to share the workload. Personalised trips are possible with prior arrangement. These can include 1 hour tasters, full day tours, kids’ fishing or alternate locations. All essential kit is provided. Guests will need to bring suitable clothing for a day on the water and a spare change of clothes. Feet will get wet launching so old soft shoes or sandals are ideal but a small selection is available to borrow.